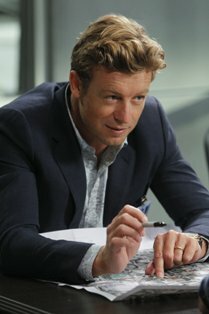 The Mentalist began airing on CBS back in fall of 2008. 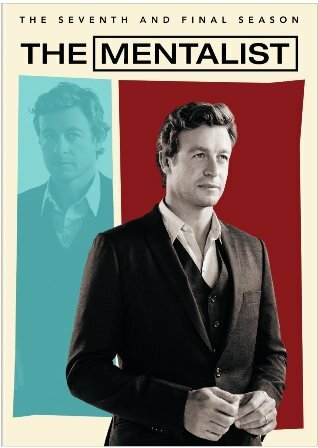 It’s all over now and The Mentalist – The Seventh and Final Season is now a three-disc DVD set currently available to own from Warner Bros. Home Entertainment. The saga of Patrick Jane (Simon Baker), a former phony “psychic” who now uses his acute observational skills to assist the California Bureau of Investigation (CBI) in fighting crime, wrapped up with a series finale on February 18, 2015. That final episode, “White Orchids,” is included here as part of the 13-episode season (incidentally, the shortest of The Mentalist’s entire run). Full disclosure up front, I hadn’t seen a single episode of The Mentalist prior to delving into this final season. There’s no point in trying to position myself as being truly informed about this show’s history when I’m arriving at it so late in the game. More importantly, however, is that I was pleased to discover a show so easy to jump into. The camaraderie between the primary cast members is so authentic and comfortable that it was easy to ascertain the nature of their relationships. Having been a big fan of actress Robin Tunney in the ‘90s (and having wondered “whatever happened to her,” since I wasn’t a Mentalist watcher for the last seven years), it was terrific to see her as CBI agent Teresa Lisbon. Her working relationship with Patrick, which crosses into personal territory, obviously provides a lot of The Mentalist’s heart and soul. 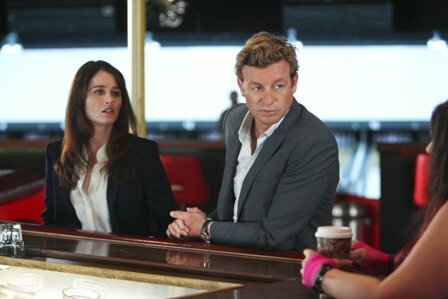 As far as episodic TV goes, the seventh season of The Mentalist offers a sturdy roster of well-told, well-acted stories. Among the standouts: “Black Market,” in which Teresa must adapt the ailing Patrick’s “psychic” skills while working a jewel heist case, “The Greybar Hotel,” which wraps up a little too conveniently but has some great moments as Teresa goes undercover as a prison inmate, and “The Whites of His Eyes,” which features a well-played guest appearance by Alexa Vega as a murder witness. It can probably be safely assumed the series finale was geared toward pleasing longtime Mentalist fans in the way it addresses the future of Patrick and Teresa’s relationship. As for special features on Warner Bros. 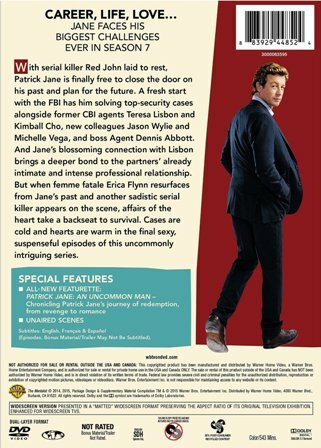 The Seventh and Final Season DVD set, there is an all-new featurette “Patrick Jane: An Uncommon Man” (12 minutes) that “chronicles Patrick Jane’s journey of redemption, from revenge to romance.” There are also a few short deleted scenes found on disc one (one scene totaling just over one minute) and disc three (two scenes totaling about a minute and a half). The DVD also includes a handy episode guide printed in a leaflet in the case.